Last night Richard Stallman spoke to a standing room only NYU Courant lecture hall consisting of hackNY fellows, alumni, and other members of the NYC tech scene. It was a very surreal experience to be introduced to, and shake the hand of, the creator of software so many people (myself included) use. He is funny. He addressed a serious issue, free software, but made clever tech jokes along the way that made the lecture entertaining. At one point he dressed up like Jesus and spoke of “the church of Emacs.” “A” for effort. 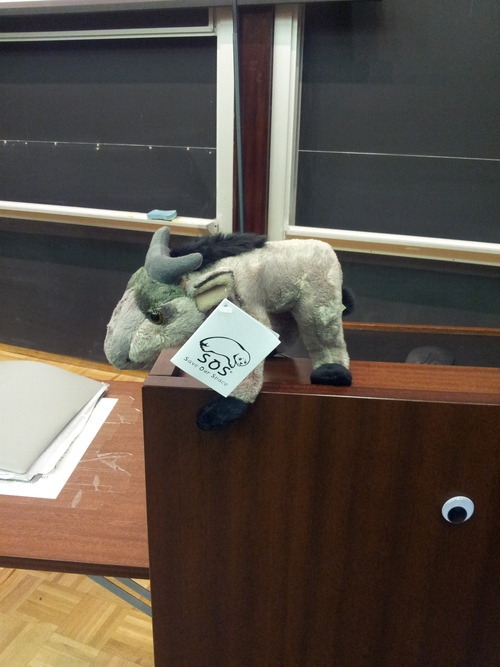 I’m really glad hackNY ‘13 had our two biggest emacs users in the front row. He is a good activist. I really, really, respect him for being so adamant in fighting for free software. It is rare to find anyone who will fight that hard for what they believe in. People give him a hard time for being so strict about his speaking accommodations, but in the history of activism you need to be extreme to have people meet you in the middle. He also had great, well prepared, arguments for opposition to his opinions during the Q&A. And he was able to raise $260 during an auction for a stuffed animal. I didn’t find any parts of his talk extreme. He talked a lot about surveillance, but given all the NSA leaks lately, his words ring very true. He liked the pasta at Vapiano. After the talk we took him there, along with some of the ISOC-NY crew and the hackNY '13 class. For some reason I thought since he’s been all over the world he’d turn his nose up at it, but he said it was good. He also took the time to socialize with the fellows at dinner, which he didn’t have to do, but was definitely a once in a lifetime experience that I am grateful he offered. It was a great night. I’ve always been partial to this movement, but as someone who is not a operating systems engineer, I did not know how to get involved. After hearing this talk, I decided I am going to try to experiment with free software licenses instead of opensource software licenses. You can read the argument for free software (instead of open source) here.